A common theme in many unusual chords is some kind of internal symmetry of the arrangement of the notes. An augmented chord is made up of two major 3rd intervals. A diminished chord is made of two stacked minor 3rds; a diminished 7th chord is made of three stacked minor 3rds. 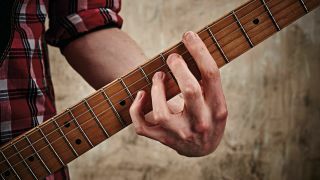 Replace the V chord in a 12-bar blues with an augmented chord for a tenser sounding turnaround. Chuck Berry opened No Particular Place To Go on an augmented chord. The striking sound of the diminished chord is often used to create tension by more progressive bands. Check out Opeth’s The Leper Affinity as an example of this. It’s hard to recommend specific ways to use these unusual sounds, so experimentation is order of the day. Generally, use them sparingly in rock and pop. Listen out for the ‘tense’ notes – these give each chord its character. Fmaj7#11 has an unusual sound, here made all the more dissonant as we’re playing it as a slash chord over an E note. The opening chord is like an open E, but played one fret higher. This chord (and the lick that follows) comes from the E Phrygian Dominant mode (E F G# A B C D). The augmented chord is spot on for this modern take on a King Crimson-style riff. Although there are several offbeat chords, we’re downpicking throughout.